Katona started his martial arts career when he was five years old, in a small Karate school in Winnipeg, Manitoba. He competed in a few small tournaments, earned his black belt in 2007 and moved on to try something new. He found the Winnipeg Academy of Mixed Martial Arts, or WAMMA as it’s called by locals. He was really just looking for a new challenge, but as soon as he started training he knew there was more in his future. To this day Katona doesn’t even remember if he won that first grappling tournament. But he says the result wasn’t important, it was the feeling of competition that got him hooked. “I got bit by the bug,” Katona said. Brad trained competitively in MMA for two years, practiced wrestling in high school and in 2009 he won his first amateur MMA fight. He fought two more times in the cage as an amateur, winning both bouts by rear-naked choke submission, and then shifted his focus to boxing. Katona earned a spot on the Canadian National Boxing Team and won multiple reputable titles, including winning the first ever Canadian Golden Gloves championship and the Ringside World Championships in Kansas City, Missouri in 2011. Brad might have had a future in the sport of boxing but that wasn’t his goal. Brad’s tools have become a lifelong work of art. 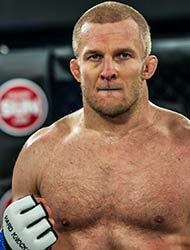 He has slowly put all the skills, from kicking to grappling, wrestling, Jiu Jitsu and boxing, together to form a complete and dangerous fighter. He loves training and sees it as easy work because he enjoys it and is working toward his dream of being the best. Brad says his martial arts styles have naturally progressed and come together, and competing comes naturally to him. For the most part, his path has been a smooth one. When asked what the most difficult part of the journey has been, he struggles to come up with an answer. Katona’s determination to dominate his division around the globe and his seemingly smooth path to success might make him one of the last people you’d expect to empathize with underprivileged kids. But that is what is behind his desire to reach the top. Brad admits he hasn’t had it rough but his goal, the reason he is pushing to be the best, is to touch the lives of those who have had it rough. He sees athletes, specifically UFC fighters, reaching out to underprivileged kids and he wants to do the same. Brad teaches martial arts classes, but he wants to do more to give back to his community and work with and inspire more children. To him, it is more important than making money off of MMA. It is one of the driving reasons why he wants to be the best. And he is going to be the best, ever. Katona, with a 4-0 amateur record and now a 3-0 pro record, will face T.J. Laramie at Hard Knocks Fighting Championship’s HK50 on Friday, June 17. Laramie has three wins and one loss on his professional record and is undefeated in the Hard Knocks cage. But Brad stands behind his lifelong work ethic. Brad says in a worst-case-scenario Laramie will be just as strong as him, but he won’t be stronger. Brad believes he has the will and mental fortitude to beat Laramie, and can beat him by fighting his fight and taking control.